Leafhoppers are found all over the world, and it is the second largest family in the Hemiptera; there are at least 20,000 described species. Leafhoppers have piercing sucking mouthparts, they feed on plant sap and can transmit plant-infecting viruses and bacteria. 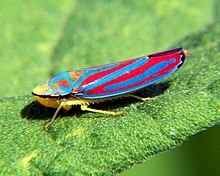 Species that are significant agricultural pests include the potato leafhopper, beet leafhopper, white apple leafhopper, two-spotted leafhopper, and glassy-winged sharpshooter. A Leafhoppers' diet commonly consists of plant sap from a wide and diverse range of plants. Leafhoppers mainly consume vegetation but have been known to indulge in small insects. front wings not particularly thickened. An additional, unique character of leafhoppers is the production of brochosomes which are thought to protect egg masses from predation and pathogens. Leafhoppers are susceptible to various pathogens; viruses as in the(Dicistroviridae), bacteria, fungi, as well as having a host of parasitoids which attack the eggs. Carver, M, FG. Gross, and TE. Woodward. 1991. Hemiptera (bugs, leafhoppers, cidadas, aphids, scale insects, etc.) In: The Insects of Australia - a Textbook for Students and Research Workers Volume 1. Melbourne University Press, Melbourne, Australia". This page was last edited on 24 April 2010, at 13:48.